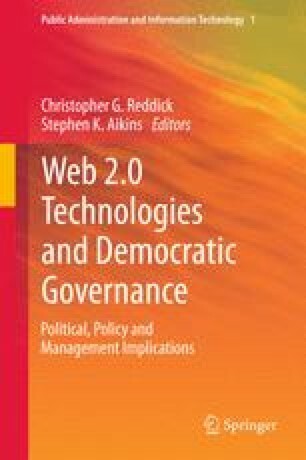 In this book, we refer to Web 2.0 as a second generation of the World Wide Web used to describe social media on the Internet—a variety of Web-based platforms, applications, and technologies which exploit the Internet’s connectivity to support the networking of people and content. These include social media applications such as blogs, photo and file sharing systems (e.g. Flickr, SlideShare, YouTube) and social networking sites (e.g. Friendster, Facebook, MySpace, SecondLife). Recent innovations in Web 2.0 technologies such as Ajax, XML, Open API, Microformats, and Flash/Flex have enabled the development and use of social media and networking through which individuals can actively create, organize, edit, publish, combine, share, comment, collaborate, and rate Web content. The chapters in this edited volume provide insights into how social media and related applications can be used to enhance the management of public service delivery, to enable online citizen-government interaction and participatory democracy, and to promote accountability.